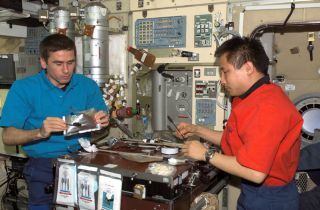 Expedition Seven Commander (CDR) Yuri Malenchenko (left - holding food packet) and Science Officer Ed Lu (right - holding spoon) stand around a table in the galley and share a meal in the Zvezda Service Module on the International Space Station. Astronauts who go heavy on the hot sauce may welcome a less-messy space food idea from four high school students. The students are developing "Stellar Strips" — melt-in-your-mouth strips containing condiment flavors strong enough to jolt any sense of taste that has been dulled by life aboard a space station or spacecraft. NASA's space food has come a long way from the early days of freeze-dried powders and semi-liquids squeezed out of aluminum tubes. Still, astronauts must put up with deadened taste sensations because their sinuses clog in microgravity. The Stellar Strips would allow space travelers to enhance bland foods with barbeque, spicy, sweet, Asian or Mexican flavors — or even simple salt and pepper — without the zero-gravity mess. "In a microgravity environment, you can't just use a salt and pepper shaker," said Myra Halpin, a chemistry and research instructor at the North Carolina School of Science and Mathematics, in Durham. "One astronaut had written about how getting hot sauce on food was a challenge — he described spinning himself around to get the hot sauce out of the bottle." The Stellar Strips idea came out of a Spirit of Innovation Challenge hosted by the Conrad Foundation and backed NASA and other government agencies. Halpin mentored the team of four high school juniors who read about the space food issues and pioneered the concept. Students are working on a self-dissolving strip similar to a Listerine breath freshener that melts in your mouth. Their first prototypes were based on rice starch strips cut from Vietnamese spring roll wrappings and dissolved in water. The starch layers could hold in not only flavors but nutrients such as vitamin C or calcium salts (for fighting bone loss in microgravity). "It was pliable, but it didn't dissolve too quickly. They tried different things like crystallizing sugar on it," Halpin told InnovationNewsDaily. The student inventors prepared a sour-lemon-flavored version of the Stellar Strips for the Spirit of Innovation Challenge held at the NASA Ames Research Center in California March 29-31. They received tips from contest judges on how to put the Stellar Strips into practice — food for thought as they continue developing the idea in their spare time. "One of the judges commented that they were concerned putting it under your tongue might be a problem, but putting it between your teeth and gums like old-fashioned snuff might be a better idea," Halpin said. A concept illustration showing how Stellar Strips could deliver flavor and micronutrients for astronauts. The students hope the strips can pass NASA safety tests and meet astronaut taste approval to get a first test flight in 2015. Six or seven pounds of the Stellar Strips in a package the size of a ream of paper could give astronauts enough flavor choices for three meals a day over 15 years. Stellar Strips even might find customers on Earth among those who experience a reduced sense of taste, such as the elderly and patients undergoing chemotherapy for cancer or taking beta blockers for high blood pressure.